Tired of constant trips to the darkroom while imaging your chemiluminescent blots? 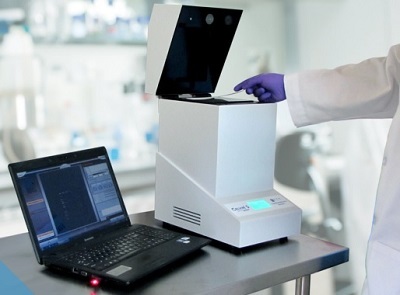 Take a look at the new Celvin, the easy-to-use benchtop chemiluminescent imager. Superior camera technology, a plug-and-play interface, and a small footprint make the Celvin an attractive choice for documenting your Westerns — and it’s surprisingly affordable, too. The Celvin fits into any laboratory. The Celvin features a double stage, peltier-cooled 16 bit scientific grade camera by biostep®. The cooling, high quality CCD chip and dark chamber result in an extremely low background. 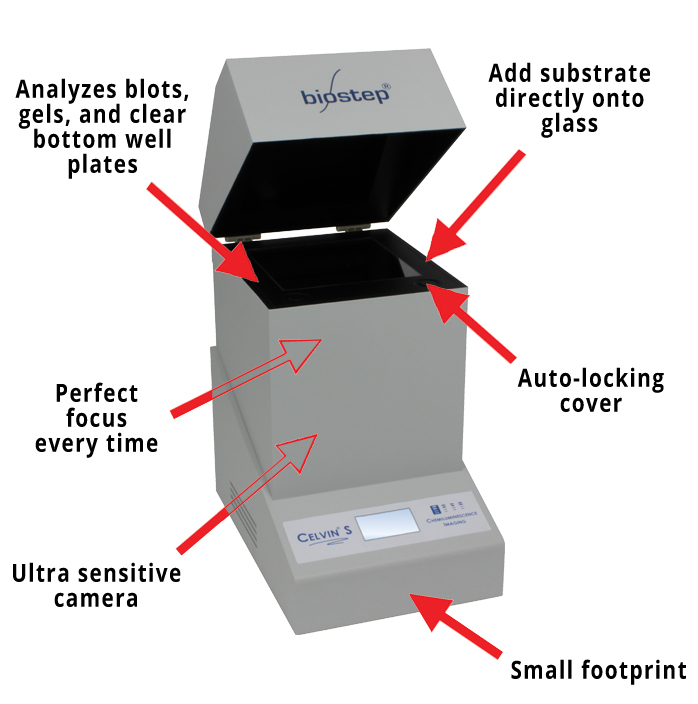 The treated blot is positioned directly above the camera on a glass plate, ensuring perfect focus on the blot and superior data acquisition. Exposures can be up to 24 hours long, for detection of very faint bands. Cameras are available at resolutions up to 8.3 megapixels with optional binning of up to 6×6 pixels. Image acquisition is controlled through an easy, touch-screen interface. Capture your chemiluminescence data, and then use the dimmable white light illuminator to record the position of colorimetrically-stained molecular weight standards — without even touching the blot in between. Once your image is in hand, the user-friendly image processing software makes data analysis simple. During image acquisition the lid automatically locks down creating a “mini-darkroom” that cannot be accidentally opened. Image blots for hours without worrying about data loss. The elegant design enables a small footprint about the size of a magazine. The Celvin will fit most anywhere in your laboratory. 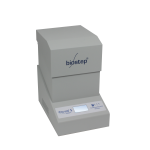 The low price includes the intuitive 1D gel and blot imaging software. Not only is the Celvin convenient and compact, it also requires no consumables to operate. No more X-ray film to buy, and no more developer reagents — all you need is your treated blot. Download the Celvin Chemiluminescent Imager brochure. The Celvin® chemiluminscent imaging systems provide the following benefits. Which Celvin is right for you? Celvin S 830 8.3 Mpixel full frame CCD, images up to 14 x 12 cm. This model has the finest resolution and also the lowest cost model. However, with the smallest pixels, it is less sensitive than the other models. Celvin S 420 4.2 Mpixel interline CCD, images up to 14 x 14 cm. This model is a nice balance between cost and sensitivity, making it the most popular model. Celvin S 160 1.6 Mpixel full frame CCD, images up to 12 x 8 cm. With the largest pixels, this model is our 2nd most sensitive model. Celvin S 320 3.2 Mpixel full frame CCD, images up to 13 x 9 cm. Our most sensitive model.